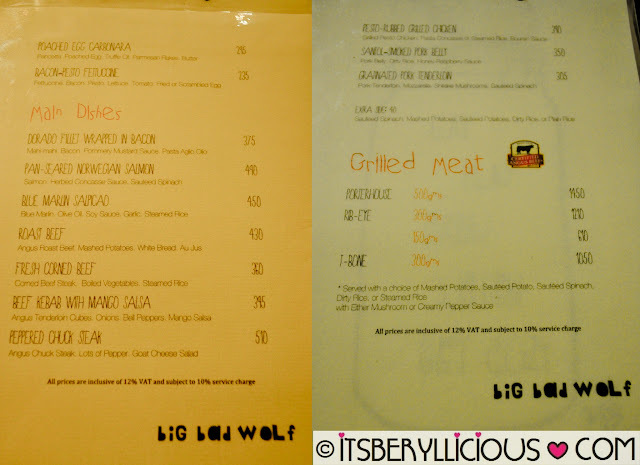 Read mixed reviews about this restaurant in Fort called Big Bad Wolf and decided to try it out. 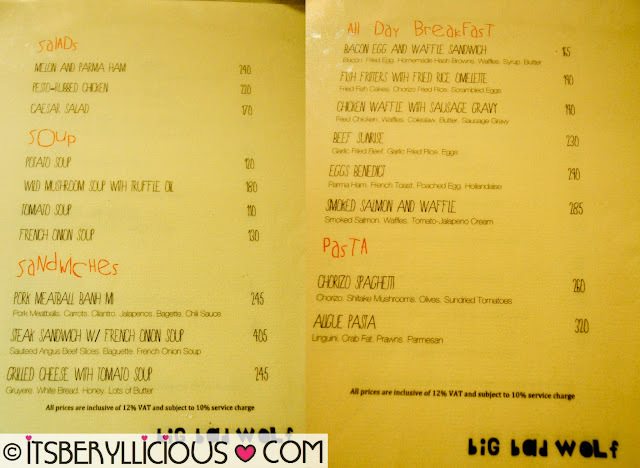 Located in Fairways Tower in McKinley, we had quite a hard time finding it since the place isn't fronting the main road. We had to ask the guard of Fairways Tower and learned that it is actually located at the back. There was an exhibit during our visit, so the waiter led us an available seat outside while he handed us the menu. 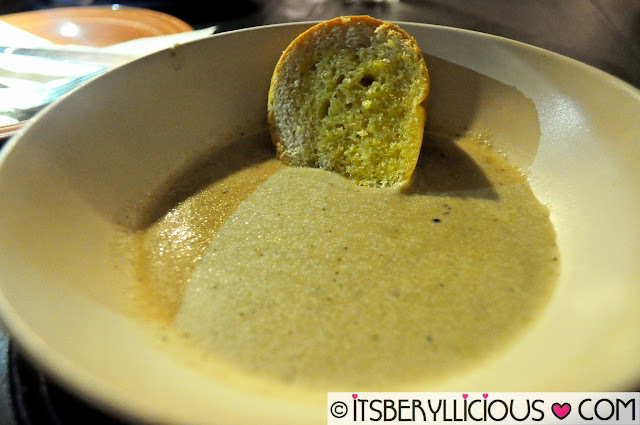 The Wild Mushroom Soup with Truffle Oil caught my interest and decided to order one. Since there were two of us dining, our server took the initiative to split our order into two bowls. The soup was rich and creamy, but also way too salty for me. 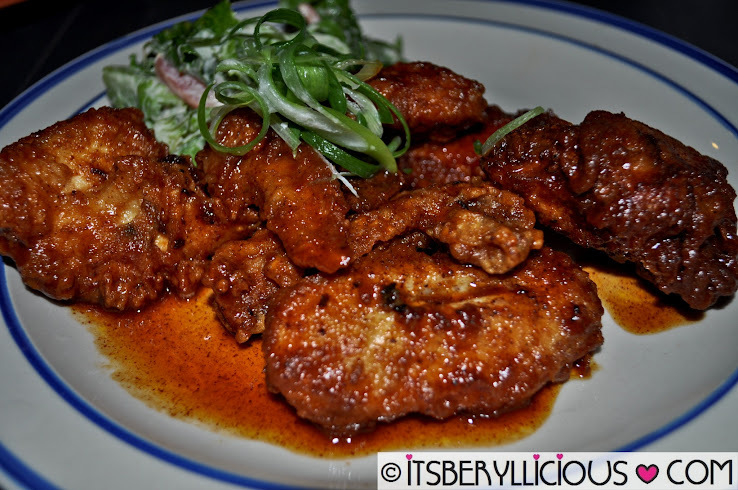 Of course, we wouldn't miss ordering their Hot Wings available either in hot buffalo or sweet and spicy sauce. We opted for the latter which was really good. My only comment was the skins were already soggy and soaked in sauce losing its crispy bite. I got the Poached Egg Carbonara for myself which is one of their bestsellers. It was a deconstructed type of carbonara with pancetta, poached egg and Parmesan flakes placed on top of it. 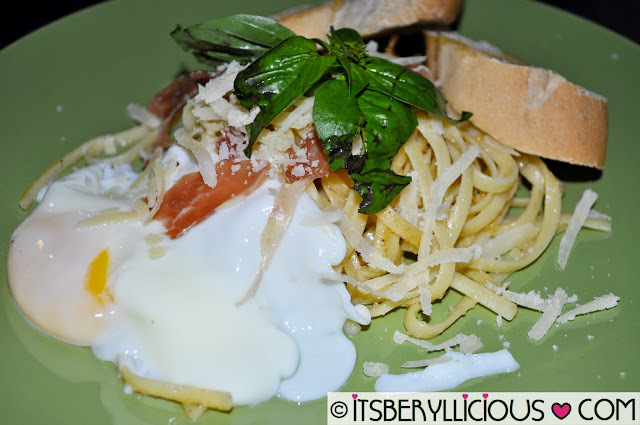 I was hesitant to mix the egg with the pasta as I wanted to eat it as is-soft and runny. But since the pasta seemed dry, I decided otherwise and carefully mixed it in. I tried a forkful and was disappointed. The pasta was bland and dry even with the egg in it. Got no help from the pancetta either. I had a hard time finishing my plate. 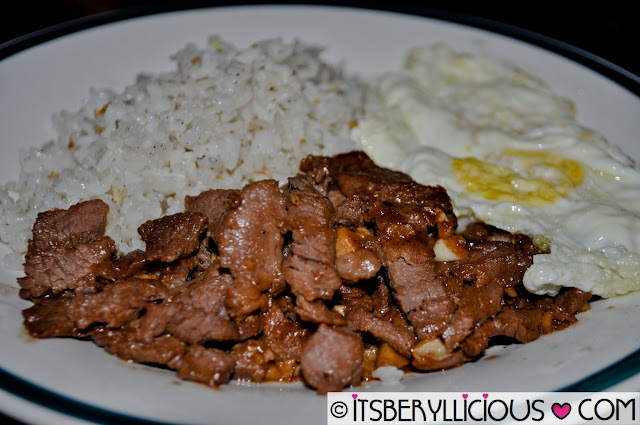 D got the Beef Sunrise which is an all-day breakfast of garlic fried rice, beef tapa and egg. His order was pretty much better than mine so his plate was wiped out in an instant. It was actually home-cooked good with simple flavors but I still prefer our favorite Garlic Tapa Overload from Mr. Jones. 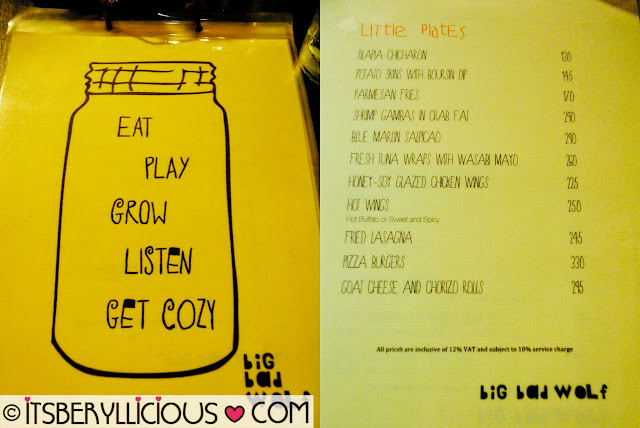 After our visit, I now understand the different and contrasting reviews of this restaurant. It was a hit and miss as some dishes were good, while some were not. Although we enjoyed some of their offerings, I would say that it would take a while before we'd make another visit. Yes. Mixed reviews for us also. Good choice on the wings. The soy glaze was the one for us. 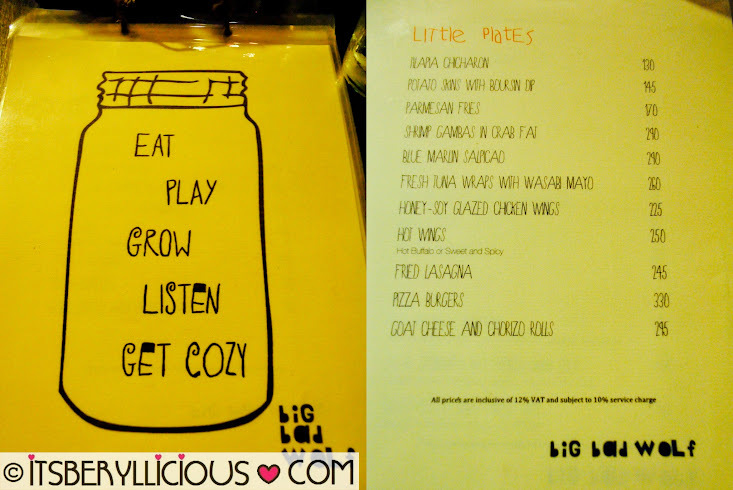 They should step up their game since there are lots of better restos in the area. 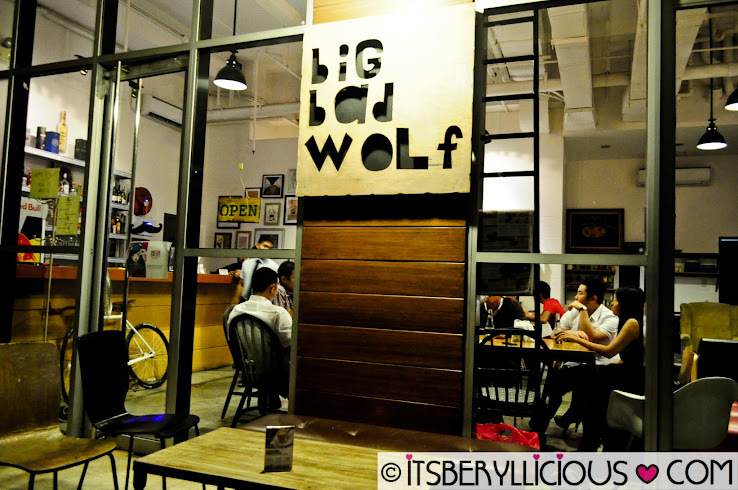 Been reading a lot about Big Bad Wolf before, but haven't tried it out yet for myself. I think I'll pass nalang muna :D The area's really far din for food that's either hit or miss.